Tens of millions of people each year visit or reside in the North Carolina and Tennessee Smoky Mountains. There are more than 30 million people with functional limitations or disabilities living in the US and there are federal laws protecting the rights of these disabled persons many of whom travel or live in the Smoky Mountains region. Most of these individuals who visit the Smokies find there is still has a long way to go in order for the Smokies to be accessible to everyone who comes here. Though accessibility of tourist attractions, accommodations, restaurants, shopping and other public places in the Smoky Mountains are improving, persons with disabilities may find some places are still unable or resistant to accommodate their special needs. We are working diligently to offer the most up to date information possible on activities and accessibility for people with disabilities of all types as well as crusading to make business and public places in the Smoky Mountains more accessible and comply with Federal ADA guidelines. Almost 10,000,000 people a year come to experience nature, history and Appalachian culture up close in the world famous Biosphere: The Great Smoky Mountains National Park which is the main attraction of the Smoky Mountains. The Great Smoky Mountains National Park features single and 2 lane paved roads, unimproved dirt roads, more than 900 miles of hiking trails, paths and nature walks, frontcountry campgrounds, backcountry campsites, picnic areas, numerous historical buildings, horseback riding stables, outdoor living museums and visitor centers. Inside the GSM national park you will find countless pull offs and places where one can admire the beautiful landscape, observe wildlife or fish in the hundreds of miles of rivers and streams teeming with gamefish. There has been a concerted ongoing effort to improve accessibility in the Great Smoky Mountains national park by the park service and although the park service has made some great strides, there is still a long way to go. Since these improvements are steadily being made, it is best to check back here before visiting the park as there may be more ways you can experience the park as more areas in the park may be accessible to handicapped persons. Although the park states in their literature that temporary handicapped parking permits can be issued if a person with a disability requests one at the Sugarlands or Oconaluftee visitor centers, we have found cases where individuals were unable to so we suggest if you wish to use handicapped parking in and around the national park that you obtain a disabled parking placard prior to coming to the Great Smoky Mountains National Park. If you do have a handicapped placard or license plate endorsement you will find that there is usually sufficient handicapped parking available for the Gatlinburg, Sugarlands and Oconaluftee visitor centers even during peak season or holidays. 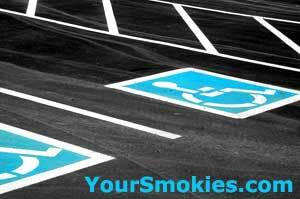 You will also find limited but sufficient handicapped parking available in the major attraction areas such as the frontcountry campgrounds, amphitheaters, Newfound Gap, Mingus Mill, the Cades Cove Cable Mill Historic area, the Sugarlands Valley Nature Trail and some of the picnic areas and pavilions. Most other areas do not have designated handicapped parking. A great way to get the most from your experience of the Great Smoky Mountains National Park (GSMNP) is to first visit one of the visitor centers in order to see the natural and historic displays, obtain printed material and maps of the park as well as to have any of your questions about the park and its current conditions answered by one of the Park Rangers or Volunteers on staff. I would recommend going to the Sugarlands Visitor Center located intersection of Newfound Gap Road (441) and Little River Road (73) near downtown Gatlinburg Tennessee as they have more material, staff and the free movie presented throughout the day in their handicapped accessible movie theater offers a fantastic view and insight into the plants and animals that inhabit the national park, the history of the GSMNP and where to go and what to do. For hearing impaired visitors, this wonderful movie about the park produced by the organization Friends of the Smokies is closed captioned. The Sugarland Visitor center has handicapped parking on both sides of the building, accessible restrooms, accessible door opening button and an accessible drinking fountain. The Sugarlands Visitor center building is completely accessible and if you require assistance getting around the building a wheel chair is available for loan and all of the ranger lead programs held in the center are handicapped accessible. There is a wheelchair accessible telephone at the Sugarland Visitor center, but it does not have audio amplification for the hearing impaired. The Oconaluftee Visitor center is located in the North Carolina side of the Great Smoky Mountains National park by the Cherokee entrance to the park on Newfound Gap Road (441) and within sight of the start of the Blue Ridge Parkway. The Oconaluftee visitor center is also a worthwhile place to spend some time with its unique Mountain Farm Museum Area and inside you will find displays about the park including a large relief map of the park, park literature and maps, a gift shop with books, park branded clothing, some hiking and outdoor equipment and plenty of trinkets to take home. 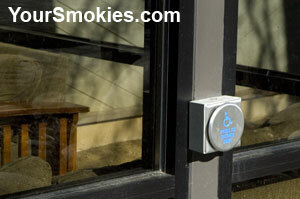 The handicapped parking for the Oconaluftee visitor center is in the front of the building and the accessible restrooms are in the rear of the building. If you do not wish to take the accessible sidewalk from the front of the building to the rear where the restrooms are, you are allowed to temporarily park in the rear of the visitor center closer to the restrooms. 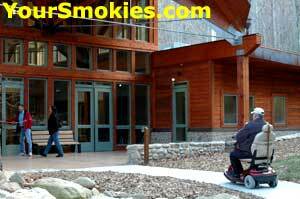 The Oconaluftee visitor center is all on one level and has ramps to enter building. A word of caution though is that the walkways to the building and the flooring inside the old visitor center are made of uneven flagstone which may present a challenge so you may want to use wheelchair available for loan. There is a wheelchair accessible telephone without audio amplification for the hearing impaired at the Oconaluftee visitor center. What makes the Oconaluftee Visitor Center really special is the Mountain Farm Museum which is a collection of historic farm buildings from the late 1800's and a real working farm complete with crops, chickens and pigs - often with live demonstrations from volunteers and rangers during peak seasons. Fortunately the Mountain Farm Museum is pretty accessible with basically flat gavel paths which are hard pack and suitable for most wheelchairs although some may need assistance. There is a wheelchair accessible ramp that will allow you to enter the historic house at the farm, but again you may need a little help as it is a little difficult for some to handle. As for the other buildings in the Oconaluftee Mountain Farm Museum, there is no accessible access but the interiors of most of the building can be observed through the doorways. All of the talks, live demonstrations and special events I have attended at the Farm Museum were accessible to everyone who attended. If you are not fortunate to visit the center when there are demonstrations, you can purchases a guide booklet and tour the Farm Museum yourself. If you take Newfound Gap Road (441) for about 1/2 a mile north you can visit the working historic Mingus Mill. While there is one step to enter the Mill, you will find assistance. To get the mill a hard packed fairly level trail with ample parking accessible parking and accessible restrooms. Volunteer millers run the mill when it is open during season and are quite knowledgeable and will explain the milling process, machinery and local history. Books and pamphlets are available for sale in the historic Mingus Mill. The Cades Cove Visitor Center and Cable Mill Historic area are located at the far end of the Cades Cove 11 mile loop road which is one of the most popular parts of the National Park. Simply put, it is a great place to tour by car but is not at all accessible. 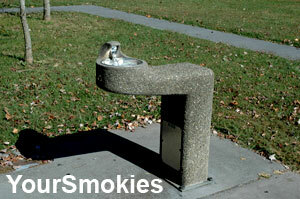 Your Smokies has created a complete auto tour of Cades Cove which you can print out and take along for the ride. While the Cades Cove Visitor Center is quite a bit smaller than the other visitor centers in the national park, it is still of interest to visit. Specific questions to Cades Cove and the surrounding area are best answered here. The Cades Cove Visitor Center has ample handicapped accessible parking near the sidewalk, accessible rest rooms, and accessible drinking fountain and the visitor center has a wheelchair accessible ramp and everything is located on a single floor. As with the other visitor centers we reviewed The Cades Cove Visitor Center does have a wheelchair available for loan, but of you need an accessible phone the closest is about 5 miles away at the Ranger station by the Cades Cove Campground. To get to the Cable Mill Historic Area you park at the visitor center and take the level, hard packed gravel trail to the historic buildings. The 2 most popular buildings in the area: the working grist mill and the Becky Cable House are accessible. As with the Mountain Farm Museum at Oconaluftee, the historic buildings that are not accessible can be view easily from their respective doorways. The interior of the Cable Mill and guided tours are only available during peak season and the Visitor Center is open year round except for on Christmas.